"The time of inaction is over. The great purpose must be accomplished." The Lizardmen are the reptilian guardians of Order. They follow the Great Plan set down by the Old Ones, as interpreted by the Slann Mage-Priests who direct the small and capable Skinks, the Saurus Warriors, bestial Kroxigor and myriad other reptilian servants. Being cold-blooded, Lizardmen reside in the warmer climates, mainly across the jungle-continent of Lustria and the Southlands. Hidden within the undergrowth are the temple-cities where the Slann contemplate and the other reptilian castes live to serve the Old Ones’ will. Shining brightest of all the ancient temple-cities is Hexoatl, the City of the Sun. Though Itza is the First City, Hexoatl has eclipsed it in importance due to its status as home to Lord Mazdamundi, the most active of all the remaining Slann Mage-Priests. 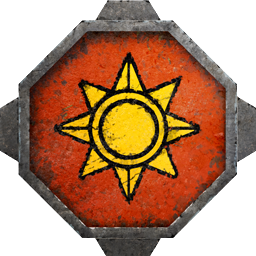 Due to its location and history, the City of the Sun is the most fortified and martial of all the temple-cities. Whereas the boundaries of most other cities simply merge with the jungle, Hexoatl has mighty walls and serried ranks of Saurus patrol its plazas. Until recently, even the Norse trespassers of Skeggi and its surrounding colonies avoided Hexoatl, although that has changed of late. Yet it is not just the city and its reptilian legions that enemies and invaders must be wary of, but its mighty leader, Lord Mazdamundi, oldest and most powerful of the living Slann Mage-priests; he who can bring ruination upon cities; he that rides the horned beast. After years of contemplation, Mazdamundi has come to a simple epiphany: the Great Plan cannot move to the next phase until the first stage has been completed. This involves relocating a few, select races and the utter obliteration of the fell spawn that infests the world. And so, with the fire of Old One, Chotec, burning within Lord Mazdamundi, the time of inaction is over – the Great Plan will be executed – order *will* come from Chaos, no matter the cost!